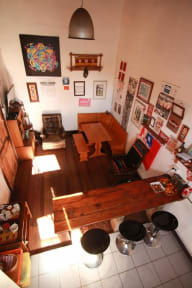 One of the best hostels in Chile. Right in the middle of the city, and Rafa was very helpful! Speedy! Hostel has everything one needs. No issues. Recommended. Really lovely owner who was super helpful! Breakfast is good with nice fresh bread, comfy bed, warm shower and well equipped kitchen. Close to the main square with lots of cheap eats. Definitely would recommend. Really nice hostel with super friendly guy. Big spacious dorm rooms with high ceiling. Free tea and coffee provided. WiFi was really good and bathrooms were kept clean and had separate toliet and shower cubicles. Only negative was there was only one plug in the dorm between 6 people. Had a pleasant stay - staff was very nice! Kitchen isn’t that big so it can get right if more than 1 is cooking. Rooms looks like it could fall apart anytime, not much of a social hostel, works fine for the price, but only to sleep. Value for money was good, but there wasn't much of a hostel atmosphere. Although the staff were nice and friendly and very welcoming on our arrival. Provided breakfast, and held our bags for us. Rodrigo was a great host. Friendly and gracious. There are no towels to borrow. This is because their dirtiness was leading to too many bad reviews, so the owner stopped giving any out. The bathroom is disgusting and shared by everyone. You will have to step through puddles to go pee at night. Beakfast consists of bread, some jam, tea, and instant coffee. The most barebones we encountered in 6 weeks. There is a nice coffee shop down the street. However, be aware that it is run by communists. 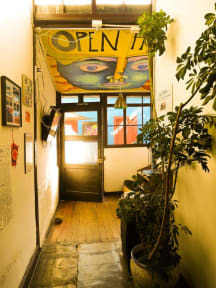 We were not too happy with our stay in open hostel, and surprised that it had such good reviews. First of all, it was very dirty in kitchen, bathroom was constantly overflooded and the bedsheets were already used (smelled bad). The owner was in the kitchen all day and a bit weird- couldn’t recommend anything. Although breakfast was included, he did not provide anything one day because of festivity/closure of the shops. This could have been anticipated. I do not recommend this hostel.